It would be difficult to miss the rafts of Himalayan Balsam invading our two communities. It was first introduced to the UK in 1839. It is now one of the most invasive and damaging plants in the UK. So much been said – so little been done ! To many it is an attractive plant – indeed it is effectively a garden escape. To others it is a menace, particularly colonising wet areas and woodlands. Studies have shown that it reduces species richness by 25%, either by blocking out light to smaller plants, else by being favoured above native plants by pollinating bees – a situation which could be deteriorating, given the massive drop in bee numbers. As the plant dies back in the winter, it leaves bare earth – and increases erosion particularly by river banks, or along ditches , which become more prone to flooding. The good news is it is relatively easy to control. It is best pulled in May, before flowering. Best practice managements suggests that all local sites, where an infestation occur need to be identified. Then it needs landowners, the council and the general public to have a co-ordinated effort. 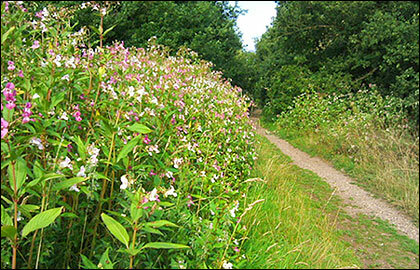 For more information on Himalayan Balsam, click HERE, or see the links on the right. The order to change schedule 9 , of the wildlife and countrydside act was made on the 9 March 2010 and comes into force 6 April 2010. Himalayan Balsam- change in legal status !!!!! The order to change schedule 9 of the Wildlife and Countryside Act 1981, will be made early in 2010 and will come into force on 06 April 2010. Section 14 prohibits planting in the wild of plants listed in Part II of schedule 9, or otherwise causing to them grow there. These provisions are necessary to prevent the establishment of non-native species which may be detrimental to our native wildlife.